Now for some Asian cuisine. Being Teochew (a dialect group from South China at the eastern side of Guangdong province), I am of course a fan of Teochew braised goose (潮州鲁鹅). 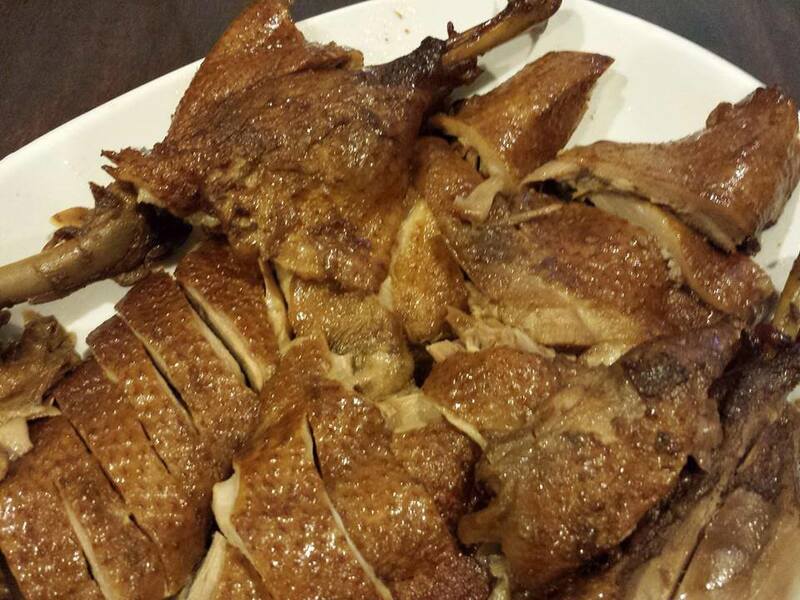 Unlike Hong Kong, we don’t get much of goose in Singapore, so we settle for the second best aka braised duck. Like the popular Hainanese chicken rice, though perhaps a distant second, braised duck rice is available in hawker centre & food courts all over Singapore & quite cheaply, so there is not that much motivation really (according to my “worthwhile to do or not” philosophy) to attempt Hainanese chicken rice or teochew braised duck unless I can do this easily and produce something of equal or better standard than most I can get easily & cheaply outside. 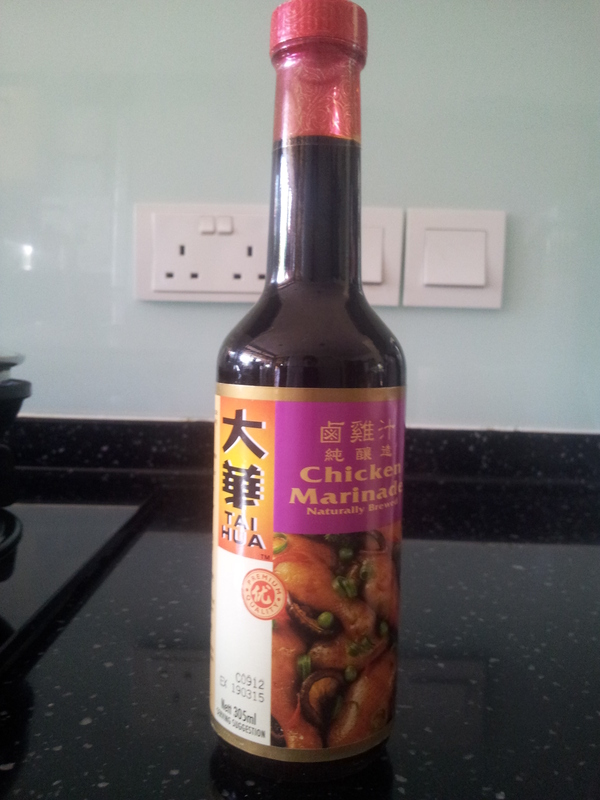 Well, I have NOT found it yet for chicken rice, BUT I might just have got it for my braised duck! This really a very simple recipe, as all I am doing is like using Tai Wah chicken marinate (大华鲁鸡汁) I bought for S$2.60 at Giant hypermarket, add an entire bulb of peeled garlic cloves (for 1/2 a duck – you can of course use the whole duck if you like, for me I only do 1/duck as my family cannot finish 1 duck & my group dinners include many other dishes so I also do not want to cook 1 whole duck which I did only on the occasion of the 22pax home buffet on 5.5.2013 and 27pax 11-course home buffet on 7.11.2013), cinnamon sticks, star anise and bay leaves, and braise for 1 hour. voila! Prepare the duck – use kitchen scissors to cut off the neck & the feet. cut through the body in 1/2. use a heavy knife or chopper if required. wash, clean & dry with kitchen towels. 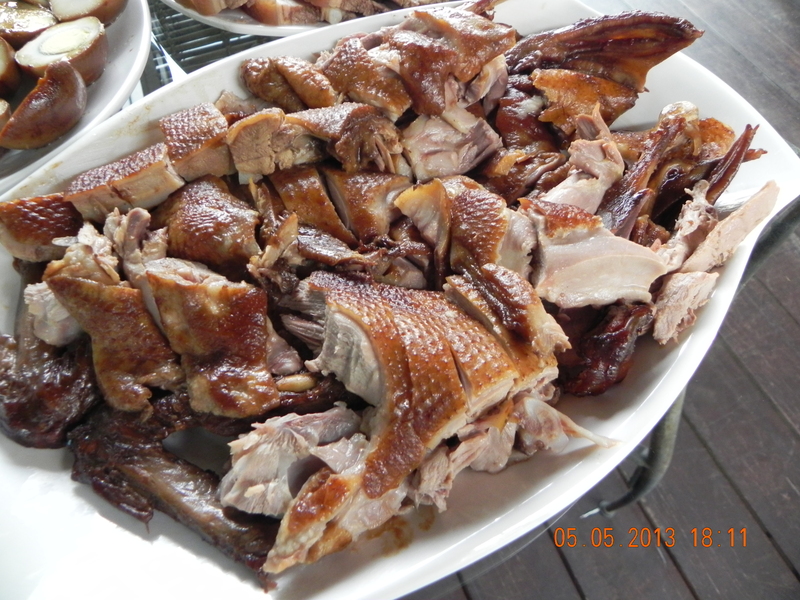 Cooking the duck – rub the 1/2 duck with sugar all over the skin side & the inside. In a large wok, stir fry the peeled garlic cloves to brown over low/medium heat, and add star anise, cinnamon sticks & continue to stir-fry until you can feel the aroma. turn to medium & place the duck skin down and using your hands, push the skin onto the wok surface to brown a little for 5 minutes. turn heat to high & add 1 cup of Tai Wah braising sauce and 3 cups of water enough to cover 80% of the 1/2 duck. bring to boil, cover with glass lid & lower fire to minimum and braise for 1 hr. The braising liquid should continue frothing a little & nearly cover the 1/2duck. use a ladle & base the duck with the braising liquid every 15minutes. 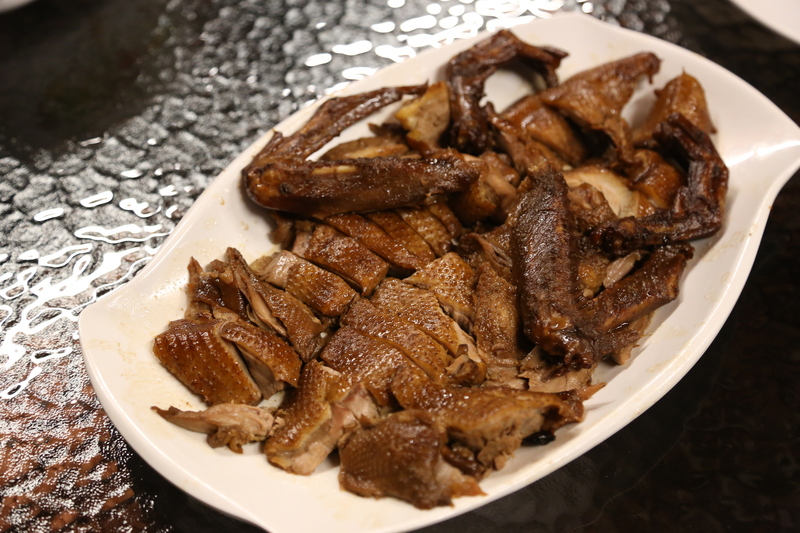 remove duck from wok & place on a cutting board to rest. empty the sauce (through a strainer if required) into a bowl. lift off the thick layers of oil. The sauce can of course be used to cook eggs & beancurd. 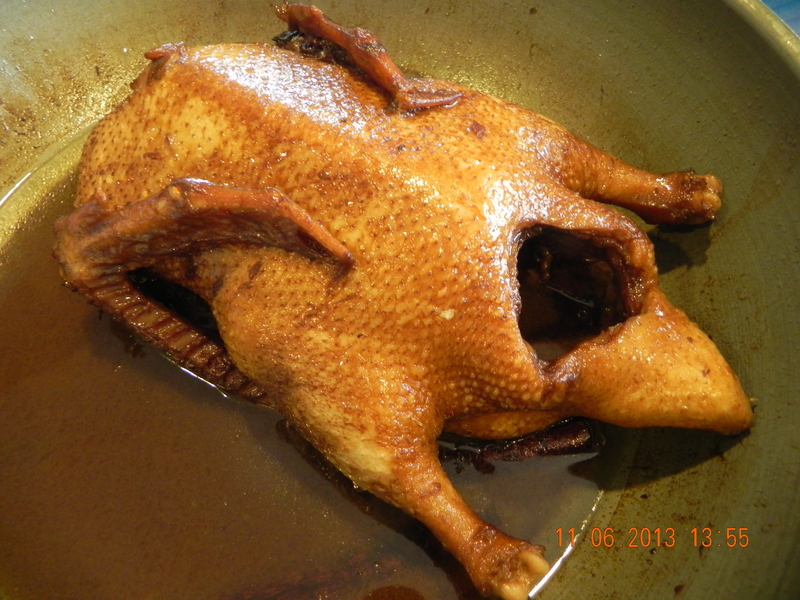 Serving the duck – I debone the duck & place in a serving dish w/o basing the sauce over. I keep the sauce in a bowl next to the serving dish so the dinners can use the sauce as dip if they prefer. 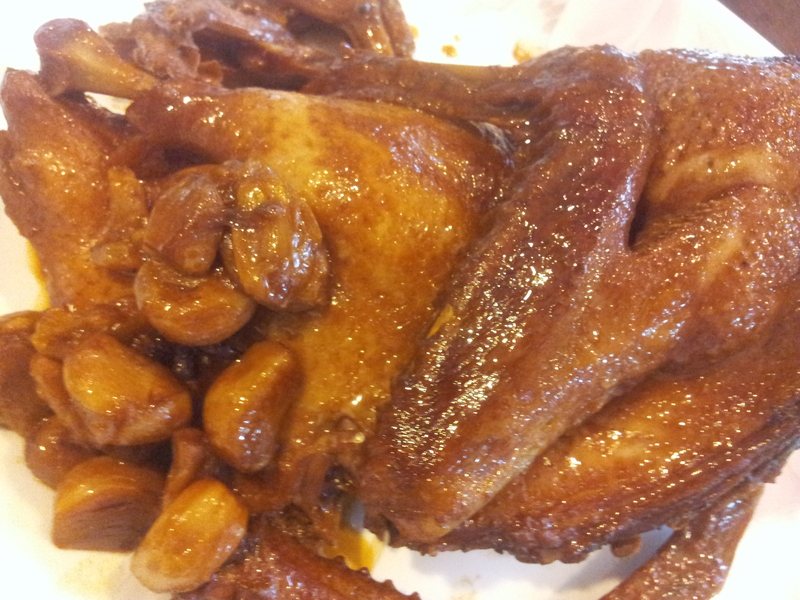 This entry was posted in Recipes and tagged braised duck, braising sauce, Tai Wah chicken marinade, teochew. Bookmark the permalink.